Do you want to own a piece of television history? The two-story residence used for exterior shots of the Dunphy clan’s house on the Emmy-winning television series Modern Family just hit the market with a $2.35 million asking price. Located at 10336 Dunleer Drive in Cheviot Hills, the 2,792-square-foot pad boasts four en-suite bedrooms, 4.5 baths, a formal dining room, a gourmet kitchen, an outdoor patio, and gardens. No word yet on whether the staircase has a broken step or not. The dwelling, which was built in 2006, just three years before Modern Family debuted, pops up weekly in establishing shots on the series. It is also used occasionally for on-location filming, which means the property comes with a built-in income. The owner is paid each and every time Modern Family films on the premises. Only the exterior of the home is used in production, though. The colorful interior exists on a soundstage at 20th Century Fox Studios in Century City, where the series is lensed. Seeing photos of the real-estate listing’s actual interior is rather jarring, as it bears little resemblance to what we see on TV each week. I’ve been obsessed with Modern Family ever since the first episode aired, so I visited the three main houses featured way back in 2009. Jay and Gloria’s modern abode is at 121 South Cliffwood Avenue in Brentwood, and Mitchell and Cameron’s duplex (which I think is my favorite of the three, although it’s a rather close call since they’re all pretty darn fabulous) can be found at 2211 Fox Hills Drive in Century City. If I had $2.35 million burning a hole in my pocket, I’d love to own the Dunphy pad. And you can bet that if I did, I would so be making my family pose outside of it holding a picture frame for next year’s Christmas card. 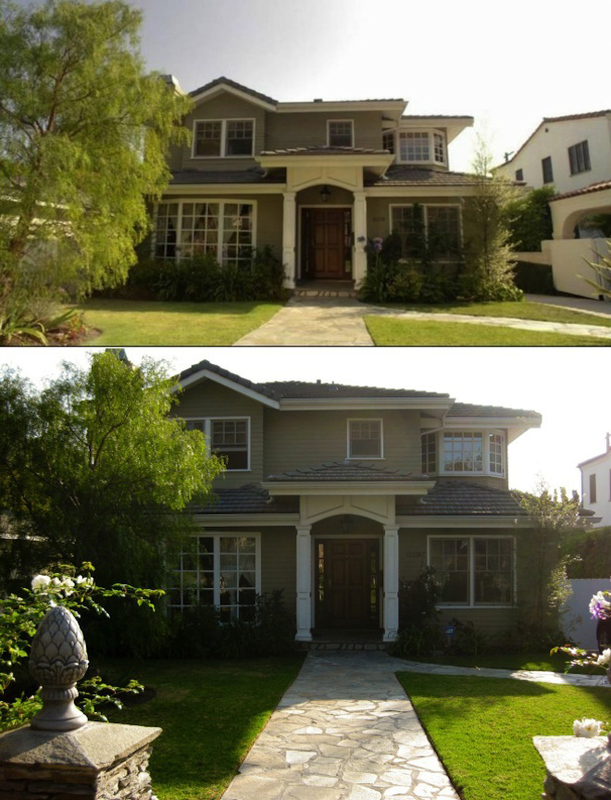 Photos: A screen capture from Modern Family (top) and a photograph of the residence taken in November 2009, courtesy of Lindsay Blake (bottom).